Watching the Detectives… The BBC has released a triple-threat crossover promotion for its series, Sherlock, Luther, and The Fall. 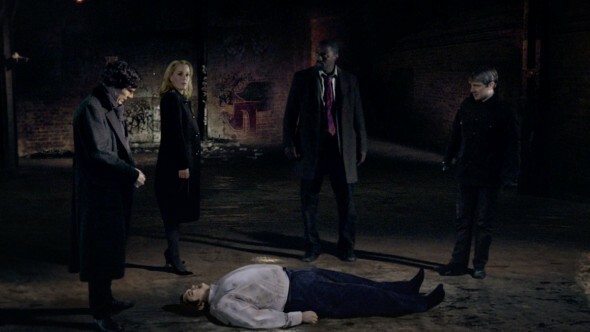 Using existing footage, the promo features Benedict Cumberbatch as Sherlock Holmes, Martin Freeman as John Watson, Gillian Anderson as DSI Stella Gibson, and Idris Elba as John Luther. Watch it, below. Luther just returned to BBC One and BBC America, for its very mini fourth series (season). A special Victorian-era episode of Sherlock, “The Abominable Bride,” will air on BBC One and PBS on New Year’s Day, with season four production set for spring. A BBC Two premiere date for the third season of The Fall, has not yet been announced. Did you catch the Luther mini-series a couple of weeks ago? Are you looking forward to the return of Sherlock and The Fall? What did you think of the promo? Tell us. More about: BBC America TV shows: canceled or renewed?, BBC One TV shows: canceled or renewed?, BBC Two TV shows: canceled or renewed?, Luther, Luther: canceled or renewed?, PBS TV shows: canceled or renewed?, Sherlock, Sherlock: canceled or renewed?, The Fall, The Fall: canceled or renewed? love it. I watch all three of them. I would watch the heck out of a real crossover between Sherlock, Luther, and The Fall. Thanks for reading and commenting, Debby.